Find out about some of our past projects at Jardar Systems. We have worked with numerous clients throughout the United States and beyond. Contact us to find out more about our work. 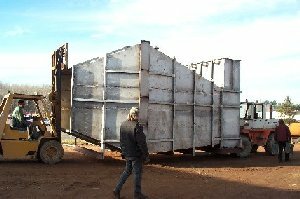 This charcoal kiln oxidizer was designed to incinerate heavy particulate organic matter without fouling. 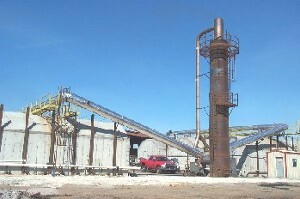 This facility uses "Missouri"-style kilns to produce the basic char that charcoal is made from. During the process of carbonizing the wood, wood tars and oils are emitted from the kilns, which can cause fouling in the ductwork and the incinerator. Working closely with the plant personnel to improve the kiln productivity and safety, Jardar Systems designed a system to resist fouling and recover energy from the stack outlet. As can be seen from the picture, all the organic matter is oxidized and the stack opacity is zero. This 100,000 ACFM 316LSS wet scrubber was designed to remove taconite dust from a gas stream of a plant located in the Mesabi Range of Northeastern Minnesota. Taconite is one of the most abrasive substances found in mining operations. In the process of manufacturing taconite pellets from iron ore, large amounts of humid ventilation air containing the dust are produced. The most efficient piece of air pollution control equipment for removing the dust is a heavy-duty industrial wet scrubber as shown here.